The family-owned company Max Bögl, founded in Neumarkt 1929, is one of the largest construction companies in Germany. Around 6,000 people are employed in the fields of building construction, civil engineering, road construction, tunneling, civil engineering, infrastructure projects, wind energy and raw material extraction. In total the Max Bögl fleet consists of around 1000 large machines including excavators, dumpers, compactors etc. The company also owns two Atlas Copco COPROD drill rigs, a ROC F7 and a new SmartROC C50. In the area of raw material extraction Max Bögl is operating gravel, sand and dimensional stone quarries throughout Germany. The development of the quarrying industry in Germany is very much connected with construction projects. Regional, social and economic developments are also affecting the construction industry and, accordingly, the production of raw materials. In Germany, the production of raw materials has been constantly developing, whereas the natural stone industry has seen a rising trend. This is due to the higher demand for sustainable products. In order to keep up with this trend the Max Bögl Group is always working on optimizing the operation of these quarries and is therefore looking for equipment that improves operational processes with a special focus on occupational health and safety. Looking at drill rigs it is important for the Max Bögl Group, that the machine itself consists of quality components and is durable. However, the main focus is still work safety and the people. The drill rig needs to be equipped with the latest safety and ergonomic standards, the control has to be easy and intuitive. Ultimately, all relevant employees from the operator to the purchaser are involved in the decision making process to guarantee that only the best fitting equipment is being acquired. 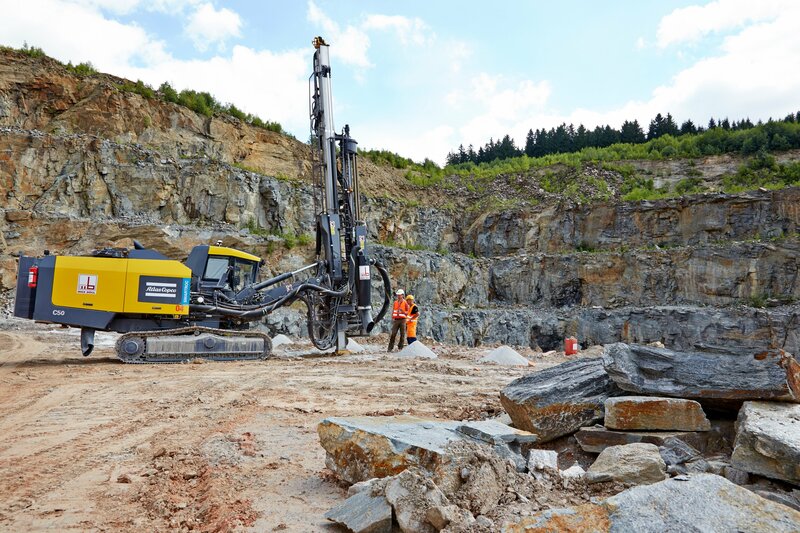 The quarry manager Christoph Zimmermann is convinced that these requirements are met by their two Atlas Copco COPROD drill rigs, a ROC F7 and a SmartROC C50. Other advantages of the machines, from the perspective of the Max Bögl Group, are “the quality drill steel and the longevity of the machine.” Using the ROC F7 for more than 17 years the Max Bögl company was able to experience the longevity of Atlas Copco drill rigs themselves. The initial decision to buy the ROC F7 with the COPROD drilling system was mainly influenced by the geological conditions. The fissured rock with high quartzite content caused severe hole deviation and presented special challenges for the production process, since blasting and crushing are directly affected by the drilling results. Another problem was the excessive wear on the drill bits and the jamming of rods in the hole. This resulted in a drastic increase of consumables costs. After a demonstration with the ROC F7 CR, it became clear that the COPROD system will be able to solve these problems by producing quality holes with reduced wear on drill steel and bits. Therefore, the expectations of the new machine were very high. So far the SmartROC C50 was able to live up to these expectations, since it proved to be a high quality, robust and compact drill rig with many advantages. “The COPROD system is simply ideal for our Rock conditions with a high Quartz content. Further we were also excited by the new technology and electronics of the SmartROC C50.”, says Mr. Zimmermann. This aspect is especially of importance since the rigs are used in three different quarries with challenging geological formations like gneiss or granite. Max Bögl´s focus on “sustainability” is also supported by using the SmartROC C50. The fuel consumption has been reduced enormously allowing to lower exhaust emissions and operating costs in the long term. The operators benefit from the intuitive Atlas Copco control system, as well as from their ergonomic design. With these benefits the job satisfaction of the operator has been increased along with the productivity throughout the entire operation. Another reason for Max Bögl, represented by Mr. Zimmermann, to recommend Atlas Copco drill rigs is the excellent relationship between the two companies. The key to the successful cooperation over the years has always been the fair communication among each other and the great service coverage.